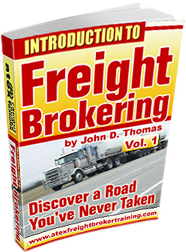 When you begin to build your freight broker business you are usually treading on new ground. You are trying different things to get started. You monitor and record the results of your effort. Then you tend to zero in on one or several strategies. Sometimes starting out, however, you may feel uncomfortable in the new ground that you are treading. This is normal. Other times, you may be uncertain about what path to take. This is normal too. With most business start-ups there are seldom one or two exact routes to success. In fact, with most start-ups, there is no absolute assurance of success. The tactics that you employ may or may not bear fruit. Franchise options like restaurants, especially, may be an exception and may offer more probability for success than non-franchised companies because, with franchises, there IS a comprehensive set of procedures that one dares not to change or ignore. Why? Not knowing how to monitor your results. One tactic that can be useful starting out, and probably seldom considered, is to check out your competition. You can do this “behind the scenes”. Or, you can sometimes approach them in person and explain that you will not be in direct competition with them (if this is the case). So, by using a combination of talking to others (even the competition), doing your own research in libraries or with notable resources in your community and putting your own thinking cap on – you might just be headed for starting a business that will endure for generations. If you want to get on a more fast-track to getting started, consider the benefits of training via telephone and Internet OR live training right here in El Paso, Texas. You can be calling on shippers in as little as 30 days or so after starting training.